One of the top things to do in Puerto Escondido is experience the awe-inspiring power of nature. Although the state of Oaxaca has less than 5% of Mexico’s total land area, it’s home to 50% of Mexico’s plant species, 60% of its bird species and 50% of its mammal species. 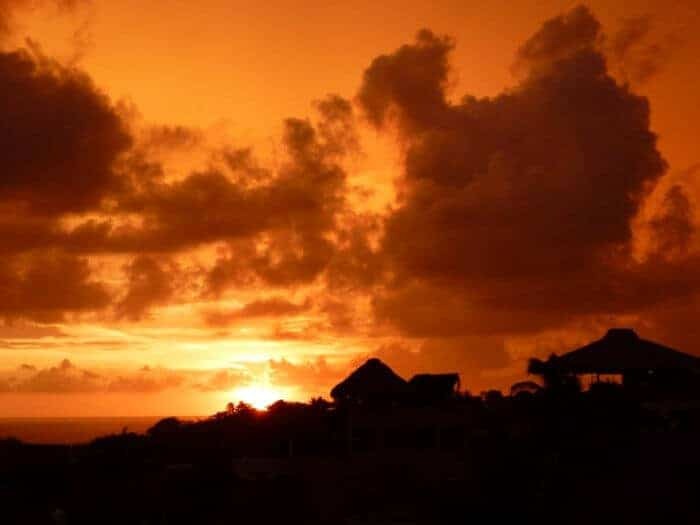 Here are our favourite things to do when it comes to outdoor adventure, sports and wildlife watching if you’re visiting Puerto Escondido, Mazunte or Huatulco. 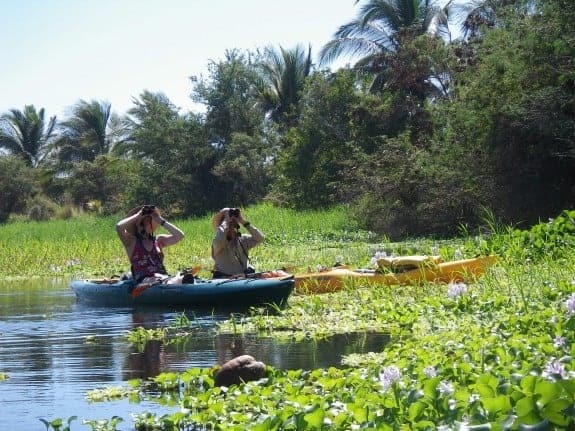 If you’re interested in wildlife, one of the top things to do in Puerto Escondido is explore Manialtepec Lagoon, a convergence of three ecosystems, each hosting unique flora and fauna. There are 285 species of birds found in the region and it’s possible to see up to 70 species of birds on a trip to this protected lagoon near the pueblo of Bajos de Chila, just 10 minutes outside Puerto Escondido. In 2017, ornithologist Mike Malone retired his popular Hidden Voyages Ecotours, so now your best guide options include Dimar Agency, Javier Santos and Lalo Ecotours, who offer several tours including the unique Bioluminescent Tour of the Lagoon, a rare opportunity to witness the magical bioluminescence of phosphorescent plankton. It’s best experienced on a moonless night. See Travel Planner Below for tour operator contact details. Another one of the top things to do in Puerto Escondido is to do some wildlife watching on the ocean. From November onward, it’s possible to enjoy whale watching as migrating humpback whales pass through local waters. 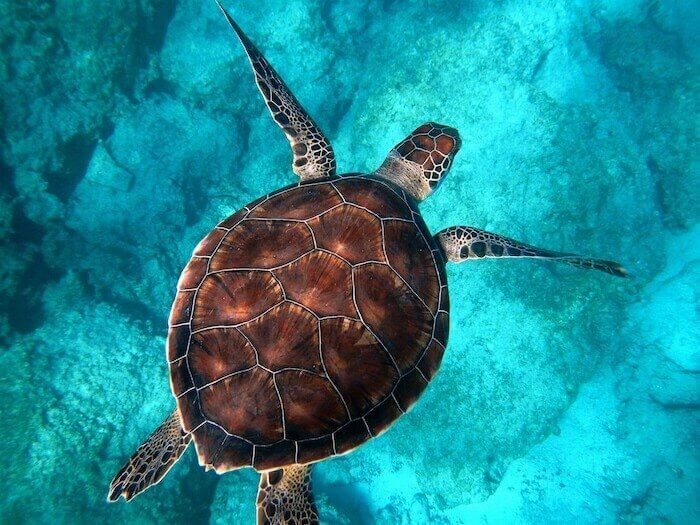 Year-round you can see sea turtles, manta rays and many types of dolphins. Tour operator and dive instructor Deep Blue Dive (located in Beach Hotel Ines) offers a morning excursion with a great track record of sightings. They are also responsible tour operators and don’t chase whales or harass other marine life by getting too close. During my most recent trip, hundreds of dolphins were racing alongside the boat, jumping and spinning much like in this incredible Video of Spinner Dolphins in Puerto Escondido. Watching sea turtle eggs hatch and seeing the baby sea turtles emerge and run to the ocean is both exhilarating and feel-good inspiring. Puerto Escondido and the coast of Oaxaca is one of the world’s top destinations for nesting olive ridley sea turtles, so your likelihood of seeing a nesting or participating in a turtle release is quite high during the months of July-December. Check with Gina Machorro at the Tourist Information Booth for times and locations of turtle nestings and releases at La Escobilla, near Puerto Escondido. The Mazunte Turtle Centre in Mazunte regularly hosts turtle releases. Read more about it in this post. Hotel Villa Sol (Bacocho Beach) and Vivo Resort ( north of Puerto Escondido) both often offer turtle release experiences for their guests. Pacific Coast sunsets are incredible. Watch for the “green flash” a rare phenomenon sometimes seen as the sun drops below the horizon. Be humbled by the majesty of a brilliant sunset from vantage points in La Punta, Zicatela and Carrizalillo. The best places to enjoy a margarita or other cocktail at sunset include Espadin Restaurant ( located within Villas Carrizalillo), Fresh Restaurant (Zicatela), the rooftop of the Ben Zaa Hotel or any of the beach bars in La Punta. It’s also possible to go surfing at sunset to get up close and personal with the magical merger of sky and surf. Journey into the Sierra Madre Sur mountains by Riding Horseback to Atotonilco Falls where you can soak in steaming thermal hot springs or take a dip under the refreshing La Reforma waterfall. 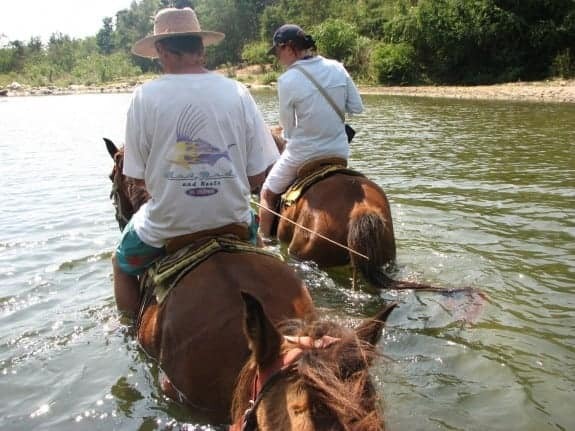 You can contact local trail-riding expert Javier Santos (044 954 1350188 or via email at javierdepuertosuelo@gmail.com) who has a stable of horses and offers tours by horseback as well as lagoon and waterfall tours. 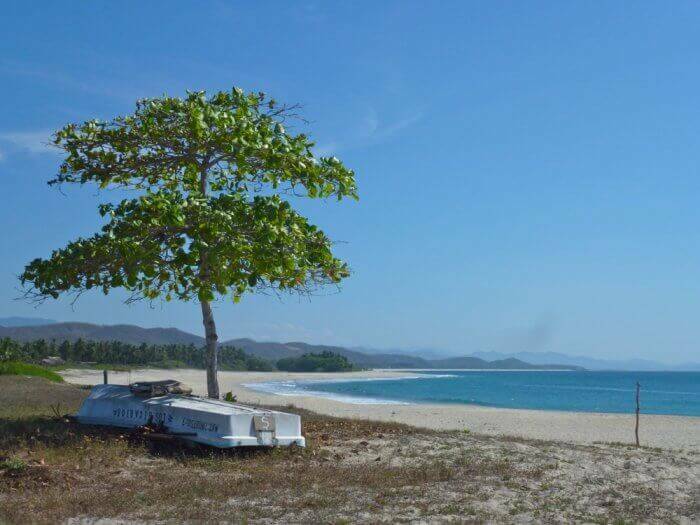 Both Agua Blanca and Roca Blanca are still-wild beaches where you’ll see few crowds and can spend the day lazing in a hammock enjoying fresh oysters and grilled fish. 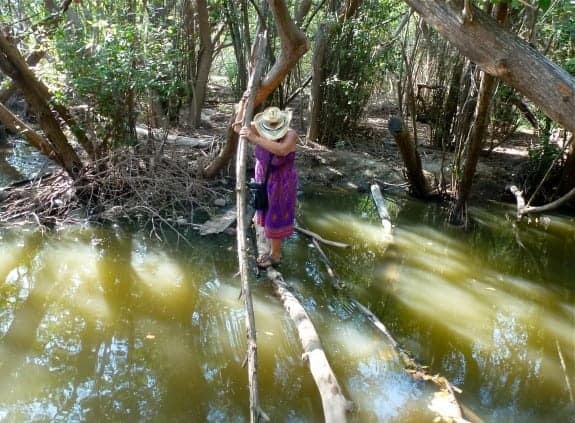 Hike the jungle and tour a crocodile-infested lagoon at Barra de Navidad (Oaxaca), just a five minute ride out of town past La Punta. 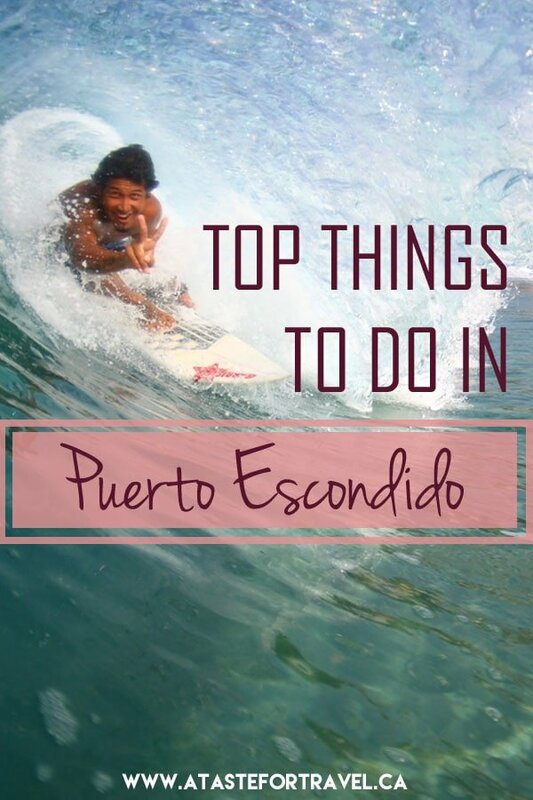 When it comes to adventurous things to do in Puerto Escondido, getting scared silly is a good sign you’ve ventured far off the beaten path. Learn about hiring a local guide to explore this incredible wild lagoon. From bird-watching to dining on fresh-grilled fish at the water’s edge you’ll feel as though you’re far from civilization. Surfing is definitely the top outdoor adventure in Puerto Escondido and while Zicatela Beach is famous for the Mexican Pipeline, a challenging break reserved for the most skilled surfers, there are many other beaches in Puerto Escondido available for beginners. We suggest contacting Zicazteca Surf School ( located at the Hotel Rockaway on Zicatela beach) or Oasis Surf and Language School (on the Rinconada ) for skilled instructors, surf lessons and surf tours for all levels. 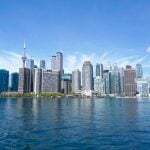 Disclosure: A Taste for Travel participates in affiliate advertising programs. Read more on our Disclosure Page. Thank you for supporting our website! There is a lot of wonderful nature inspired ideas and how fantastic is that…that walk through the crocodile water – hopefully that’s not a real bridge there! I’d come for the dolphins and sunsets! What a piece of paradise you live in! What a wonderful collection of ways to experience nature. It’s always interesting when you can find several ecosystems in close proximity. It looks like you forgot one experience in your list: get real close to blood sucking mosquitoes. LOL! It certainly looks like several of these inspiring excursions require a fair bit of mozzie protection. 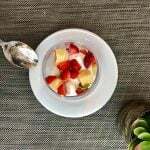 Great article Michele! It makes me appreciate Puerto even more! Sounds like you’ve got some great reasons to inspire and motivate you to stick to your New Year’s resolution. Every one of these experiences are things I’d love to do! Just might be the best New Year’s resolution ever! Unbelievable. Such lovely eco-friendly adventures. We’d love to do the swamp trekking and swim with dolphins in the wild. 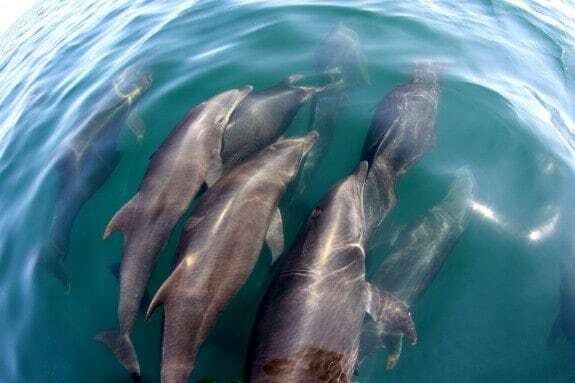 (We swam with wild dolphins off the coast of the Big Island of Hawaii – we really had to swim fast, and even then it was virtually impossible to keep up with them!) We have friends heading to Puerto Escondido in February – we’re sending them the link to this post :-). Spinning dolphins, baby turtles, crocodile -infested swamps, fantastic sunsets and much more! What a wonderful adventure tour! Love the photos! It’s so great that the animals thrive there and that tours are available to get the less athletic of us out to see them! Oaxaca is a such a beautiful part of Mexico. Michelle – well written and great info, all happening now in 2015. On yesterday’s ecotour on Manialtepec Lagoon we observed 11 species of herons, Roseate Spoonbill and Bat Falcon – a rarity, among many other species. In addition to the 7 wonders you mention a trip to the nearby coffee plantations at 3,000′ and mountain villages there is a highlight for many. Thanks for the update Mike…I’d love to see those Roseate Spoonbills! 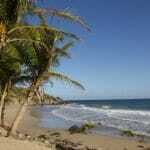 What great adventures in Puerto Escondido! I’d most like to take part in the turtle release. Swimming with the dolphins is something I hope to do someday. Your photos of the sunsets are amazing and seeing the green flash would be thrilling. It look so lovely there! A definite destination for bird watchers and animal lovers. Your photos are excellent! !